* Swinging Spout diverter for use with 622 fixture or by its self. * Fits ONLY Belvedere Shampoo Bowl NOTE: this is NEW / OLD STOCK !!! sold AS IS !!! This item was acquired from a old supply house and the items have been setting on shelf in a open box so there may be dust on the item and may have some visable signs of age but are NEW and not used. Belvedere shipped these years ago wrapped up in paper with little or no protection to the chrome area. We have checked them out visably, cleaned some what and have packed-up to protect the item. The item may need the O-Rings replaced if they leak, O-Rings should be found at a hardware store in the plumbing department. 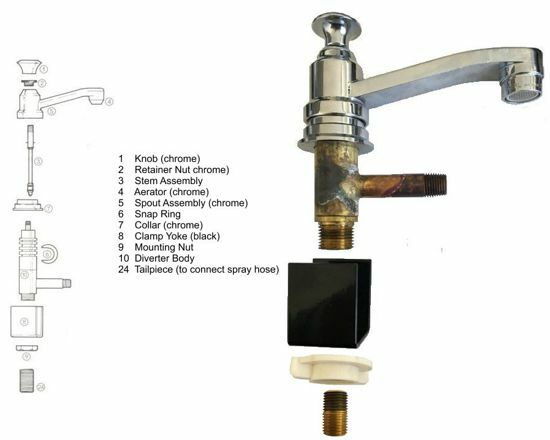 * Faucet has 4-1/2" Swivel Spout with manual Lift-up diverter knob. * Pull up to divert water through spray hose, push down to redirect through spout. * Opening in Bowl must be a Minimum of 1-5/32" Diameter and a Maximum of 1-1/2" Diameter to accommodate this fixture. Note: This diverter spout will ONLY fit Belvedere brand shampoo bowls !! !